fferences between treatment groups may arise not only due to the treatment but also because of the effect of confounders. Therefore, causal inference regarding the treatment effect is not as straightforward as in a randomized trial. To adjust for confounding due to measured covariates, the average treatment effect is often estimated by using propensity scores. In this article, we focus on the use of inverse probability weighted (IPW) estimation methods. Typically, propensity scores are estimated by logistic regression. More recent suggestions have been to employ nonparametric classification algorithms from machine learning. 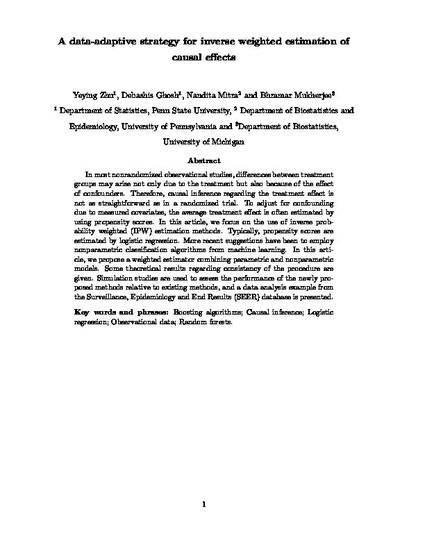 In this article, we propose a weighted estimator combining parametric and nonparametric models. Some theoretical results regarding consistency of the procedure are given. Simulation studies are used to assess the performance of the newly proposed methods relative to existing methods, and a data analysis example from the Surveillance, Epidemiology and End Results (SEER) database is presented.